us at colorcraft1978@comcast.net (and send any attachments) Â or fill out form below. Our sales representative will be glad to help you and give you a quote as per your specifications. Your phone number or email will not be shared or used for telemarketing. Feedback on product, services or experience with us. Fax a drawing to 609-386-0429 or give us an idea and we'll create a layout for you. 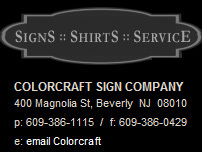 How did you find Colorcraft Sign Company's website?